Pair of Delrin Competition Control Arm Bushings for use with OEM control arms. 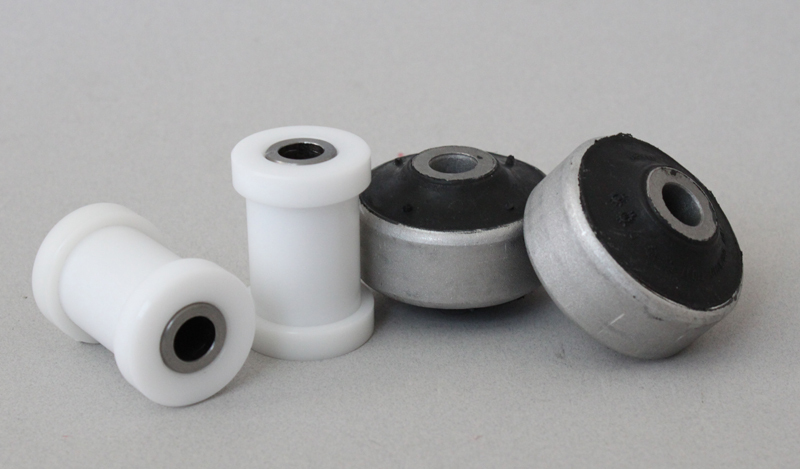 These Delrin bushings are designed to eliminate the unwanted flexing inherent in the stock rubber bushings. Allowing less flexing and geometry changes, Delrin bushings will increase the stiffness and response of your cars handling, by maintaing your alignment settings during cornering. Due to the geometry of the rear bushings, Delrin cannot be used because Delrin is too firm and would not allow the control arm to moves through its full range of motion. To solve this problem we include a pair of Heavy Duty rubber bushings for the rear mount. The included rubber bushings, are the factory bushings from the VW R32, which are a solid bushing and are harder than the OEM rubber bushing on non R32 models. These are ideal for someone looking to increase the response of their car but at a fraction of the cost of monoball bushings as well as for race cars where the class rules do not permit monoball bushings. We recommend installing these with new control arms, to ensure a tight fit.